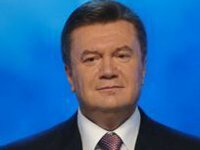 Ukrainian President Viktor Yanukovych has said that he does not consider force as a way to settle the political crisis in the country. "I want to say that I was incited and I'm incited to use various methods and ways how to settle the situation, but I want to say I don't want to be at war. I don't want any decisions are made using such a radical way," he said in an interview with journalist Vitaliy Korotych broadcasted on the Inter TV channel late on Friday, February 14. "I want to save the state. I want to restore stable development. This is my goal. Everything we're doing today we're doing for the sake of establishing peace," Yanukovych said. The president said that the truce concluded in the country is a first step towards reconciliation and the second one is to establish peace. "Here is the goal and we propose to search for compromises. When we make concessions, of course, we address the opposition asking to make concessions too. This is not about who will lose – power or the opposition… Ukraine should win," the head of state said. Yanukovych called on all politicians to refrain from radicalism and understand that "there is a line that shouldn’t be crossed" and this line is law.